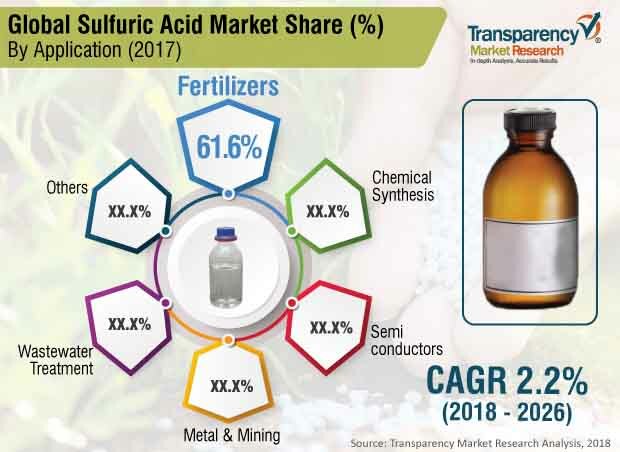 According to a new report published by Transparency Market Research (TMR) titled “Sulfuric Acid Market: Global Industry Analysis, Size, Share, Growth, Trends, and Forecast, 2017–2026”, the global sulfuric acid market was valued at US$ 12,424.86 Mn in 2017 and is anticipated to expand at a CAGR of 2.7% from 2018 to 2026. Rise in demand for phosphate fertilizers is driving the global sulfuric acid market. Asia Pacific accounts for a major share of the global sulfuric acid market, due to the increase in usage of phosphate fertilizers in agricultural activities in the region. The fertilizers segment accounted for more than 50% share of the global sulfuric acid market in 2017. Sulfuric acid is extensively employed in the manufacture of phosphate fertilizers. Sulfuric acid is used to process ammonium phosphate, calcium phosphate, and sodium phosphate fertilizers. Sulfuric acid is used as a key first step in the production of diammonium phosphate (DAP), monoammonium phosphate (MAP), and trisodium phosphate (TSP). The next step entails mixing of sulfuric acid with phosphate rock to produce phosphoric acid. These fertilizers are extensively used to increase the yield of crops to cater to the rising demand for food. Demand for fertilizers, especially phosphate fertilizers, is anticipated to increase significantly due to the surge in production of cereals and oilseeds such as wheat, rice, cotton, oilseeds, and soya bean. Government subsidies for fertilizer and agricultural development in developing countries such as China, India, and South Africa is estimated to boost the phosphate fertilizers industry. Thus, rise in usage of phosphate fertilizers across the globe is projected to propel the demand for sulfuric acid during the forecast period. Sulfuric acid is extensively employed as a raw material or processing agent in various applications. It is commonly utilized in industries such as water treatment, steel manufacturing, fertilizers, pharmaceuticals, cellulose fibers, and chemical processing. Sulfuric acid is a highly corrosive, colorless viscous liquid. It is one of the most used chemicals in a variety of processes. Additionally, it is employed to clean the surface of steel sheet, also known as pickling, prior to it being coated in a thin layer of tin to make food cans. It is also used to manufacture titanium dioxide, which is used as a pigment. Sulfuric acid is utilized to manufacture hydrofluoric acid, hydrochloric acid, nitric acid, sulfate salts, synthetic detergents, dyes and pigments, explosives, and drugs. It is employed in the petroleum cleansing process to wash out impurity from petrol and other refinery products. Sulfuric acid is also utilized to process metals such as iron and steel. Sulfur dioxide is one of the key airborne pollutants, and is carcinogenic. It is known to cause various respiratory disorders such bronchoconstriction in humans. Furthermore, sulfuric acid is a highly reactive and explosive bulk chemical. It can cause laryngeal cancer, and severe skin burns on exposure. It can also affects the nervous system. Regulatory bodies such as the Scientific Committee on Occupational Exposure Limit Values (SCOEL) and the American Conference of Governmental Industrial Hygienists have established guidelines for the usage of sulfuric acid. These regulations have been adopted in developed countries such as the U.K., the U.S., Germany, and the Netherlands. Thus, implementation of strict regulations on the production and consumption of sulfuric acid and its raw materials in developed regions is expected to adversely affect the sulfuric acid market during the forecast period. The global sulfuric acid market has been segmented based on application and region. In terms of application, the market has been divided into fertilizers, wastewater treatment, metal & mining, semiconductors, chemical synthesis, and others. Sulfuric acid is a major raw material employed to manufacture phosphate fertilizers such as calcium dihydrogenphosphate, diammonium phosphate, and triple superphosphate. Processing of phosphate fertilizers primarily requires raw materials rich in sulfur content; hence, sulfuric acid is extensively used in this application. Rise in utilization of fertilizers in agricultural activities in regions such as Latin America, Asia Pacific, and North America is expected to boost the consumption of the acid during the forecast period. In terms of demand, Asia Pacific is likely to hold a dominant share of the sulfuric acid market during the forecast period. The sulfuric acid market in Asia Pacific is anticipated to expand at a faster pace than that in other regions during the forecast period owing to the rise in consumption of sulfuric acid by fertilizer and chemical manufacturing industries in the region. The sulfuric acid market in Middle East & Africa is projected to expand due to the increase in metal mining activities in the region. Latin America is projected to be an emerging region of the sulfuric acid market, especially in Brazil, during the forecast period. The market in Europe and North America is likely to expand at considerable pace during the forecast period due to presence of well-established fertilizer and chemical manufacturing industries in these regions. Key players profiled in the report on the global sulfuric acid market include The Mosaic Company, Chemtrade Logistics Inc., Khaitan Chemicals & Fertilizers Limited, BASF SE, Nouryon, Southern States Chemical, PQ Corporation, Ma’aden, INEOS, and PVS Chemicals.